Hello, dearies!!!! 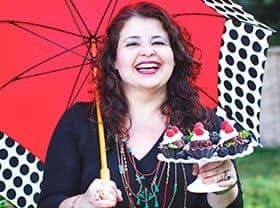 I am very happy to be sharing with you today these luscious Passion Fruit Mousse Cupcakes or Cupcakes Mousse de Maracujá… Soon we will be celebrating two important dates: The Two-Year Birthday of From Brazil To You on February 6th, and Valentine’s Day on the 14th!!! I cannot believe that almost two years have already passed by…. It seems like only yesterday when I first debuted this blog– my baby!!! Well, the baby is a toddler now, that has changed and grown in many ways, although its essence has remained the same: sharing the one-of-a-kind cuisine of Brazil with the world. I am both happy and proud to be its Mom, but I could not have done without you, dear readers, who have supported FBTY over these years. Thank you very much for your interest in the wonderful cuisine of my beloved Brazil, for following the blog on social media, and for putting a smile on my face with your questions and comments. It means all the world to me! Since last year we celebrated FBTY’s first birthday with a Crazy Gal Cake (Bolo Nega Maluca) made with chocolate, this year we will be celebrating it with these passion fruit mousse cupcakes. For FBTY’s birthday, we just had to celebrate with cake — decorated with roses… especially for you! These passion fruit cupcakes are dense yet fluffy, filled with a creamy passion fruit mousse (a staple in Brazilian cuisine), and frosted with vanilla butter cream… Yummmm!!! They are also great for baby showers, weddings, Mother’s Day, and of course, V-day! 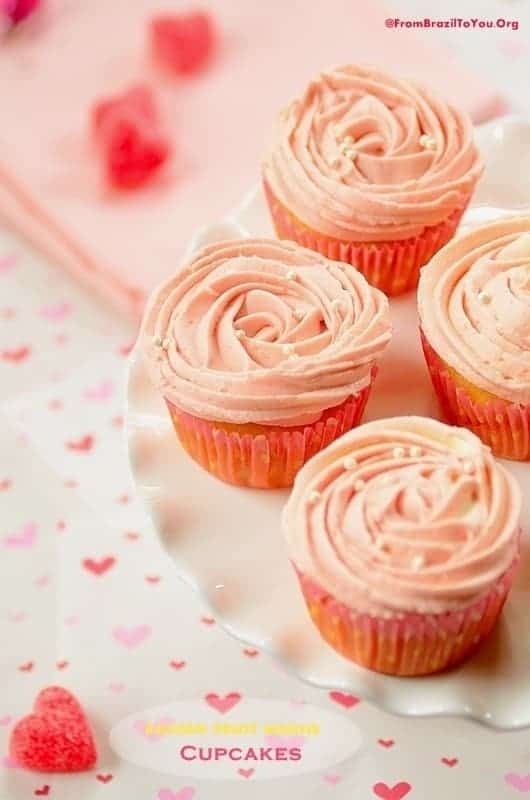 I hope that you make these romantic passion fruit mousse cupcakes and share them with your Valentine … In fact, I hope you don’t mind if I consider you as one of my valentines!!! If you would also like to add a decadent chocolate treat to your list, try our Chocolate Raspberry Brownie Stacks or Beer Brigadeiros. Happy Birthday, From Brazil To You! Luscious and aphrodisiac Passion Fruit Cupcakes filled with Passion Fruit Mousse and Topped with Vanilla Butter Cream Frosting. To make the passion fruit cupcake batter, preheat oven to 350 degrees F (178 degrees C). Line a cupcake tin and reserve. In a small bowl, combine the liquid ingredients: coconut milk or whole milk, passion fruit juice, and vanilla. Set aside. In a large mixing bowl with paddle attachment, beat softened butter for about 1 minute on medium speed. Then add the sugar, beating at low speed until light and fluffy (about 3 minutes). Add eggs, one at a time, to the sugar mixture, beating well on low speed after each addition. Alternately, add the dry ingredients or flour mixture and the reserved liquid ingredients or passion fruit mixture to the egg mixture, beating well after each addition. Using an ice cream scoop, fill cupcake liners 3/4 full with the batter. Bake for 15 minutes or until cupcakes are puffy and bounce back when lightly touched. Let cool completely on a rack before filling with passion fruit mousse and frosting. To make the passion fruit mousse, whisk all the 3 ingredients together until obtaining a homogeneous mixture. Fill cupcakes with passion fruit mousse by first cutting out a small plug in the center of each cupcake using a paring knife. The plug should be to about one half of the vertical depth of the cupcake. Reserve the cupcake plug. Pipe passion fruit mousse into each hole. Close the hole with the reserved plug -- this will require trimming off most of the bottom part of the plug so that when replaced in the hole the plug will be level with the rest of the top of the cupcake, and will not squeeze out the mousse. Place filled cupcakes in the refrigerator. For the vanilla butter cream frosting: In a large mixing bowl with paddle attachment, combine softened unsalted butter, sugar, and salt, beating well until mixture is homogeneous. Add the cream/milk and vanilla. Beat for an additional 3-5 minutes or until smooth and creamy. Beat in both gel food colorings. Using a Wilton 2D closed Star tip, pipe a rose on top of each cupcake, starting from the center and making 2 steady circles around the center (This video explains well how to do it). I also used cupcake gems (white pearls) to decorate the cupcakes. Serve and enjoy! Store frosted cupcakes in a clean airtight container (single layer) and let come to room temperature 15-20 minutes before serving. Passion fruit mousse cupcakes are aphrodisiac and great for valentine’s day, baby showers, and mother’s day… I love these passion fruit mousse cupcakes. I hope you make these delicious passion fruit mousse cupcakes! Passion fruit mousse cupcakes…. Passion fruit mousse cupcakes are super delicious! Enjoy our passion fruit mousse cupcakes. Oh they look gorgeous! I love the idea of passion fruit for Valentine’s Day, so fitting! Pinning. Thanks a lot for your sweet words and for sharing these cupcakes, Julia! I am glad that you loved the idea of passion fruit for V-day. Two years? Congrats! And what a great way to celebrate. These cupcakes are amazing — thanks so much. Thank you for stopping by, John! Have a great week! These are beautiful and fitting for the most special occasions especially anniversaries like yours and Valentines. Love them Denise and have loved getting to know you! Happy Anniversary, you’re doing a fabulous job! Thank you a lot, Chris!!!! I do appreciate your time and constant support. It has been a blessing to get to know you better for all these months. Hi. I made your recipe to the T & all my cupcakes came out with the middle underdone. I made sure they were inflated & bouncing back before removing from the oven. Are you baking these on convection? Delicious flavors, but the batter appears to be too moist. Hi, Madisen! It seems that you should have left yours in the oven for a few more minutes. As you know, not all ovens are the same. This is why the time range is not something exact. They are done when a toothpick inserted in the center comes out clean. These look so beautiful! And I can’t tell you how much I love passionfruit flavoured cupcakes. Will definitely give these a go. Well done on the icing, it’s lovely. Thanks for stopping by, Krissie! You won’t regret to give them a try… Have an awesome day! Congratulations and may you have a hundred more years of beautiful recipes, photographs and stories to share with us. You have chosen such an appropriate sweet treat for the occasion Denise. They not only look pretty but scream romance. Love them! These cupcakes are right up my alley – PASSION fruit mousse cupcakes. Most definitely orgasmic. Thanks, Maureen! I wish you were here so I’d have shared them with you. Denise – these are adorable and a wonderful way to celebrate 2 major events! 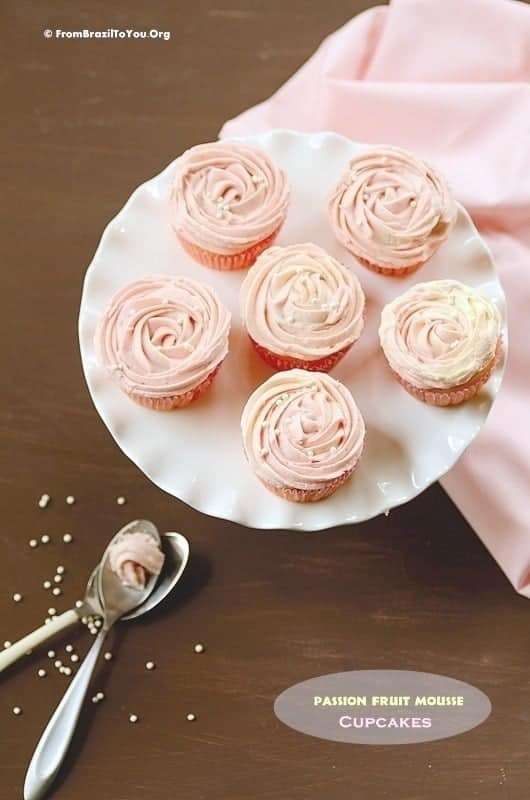 I so love the rose petal frosting on them – gorgeous! Thanks so much, Shashi! I am so glad that you enjoy my rose piping. Happy bloganniversary Denise. 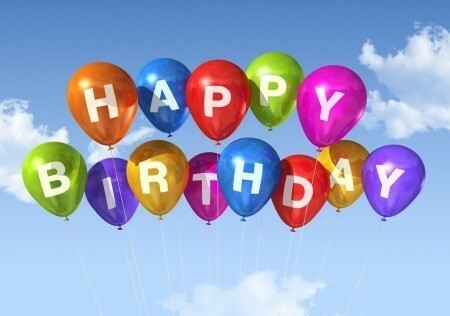 Wishing many more years of amazing recipes and stories. The passion fruit mousse cupcake is perfect for the celebration. I love the flavors and color is beautiful too. Thanks a lot for the bloganniversary wishes, Lail! I do appreciate your visits and support. Thank you both so much, Panos and Mirella! The cupcakes look fantastic, I love passion fruit. Happy Second Birthday Denise! The Passion Fruit Mousse Cupcakes are just enchanting! I adore their ethereal pink color! I discovered passion fruit this year, and now I’m addicted to that sensual aroma — great idea for Valentines’ Day! Thanks a lot, Sue! It’s one of my all-time fave fruits…I grew up eating all types of treats made from it and also drinking its juice. 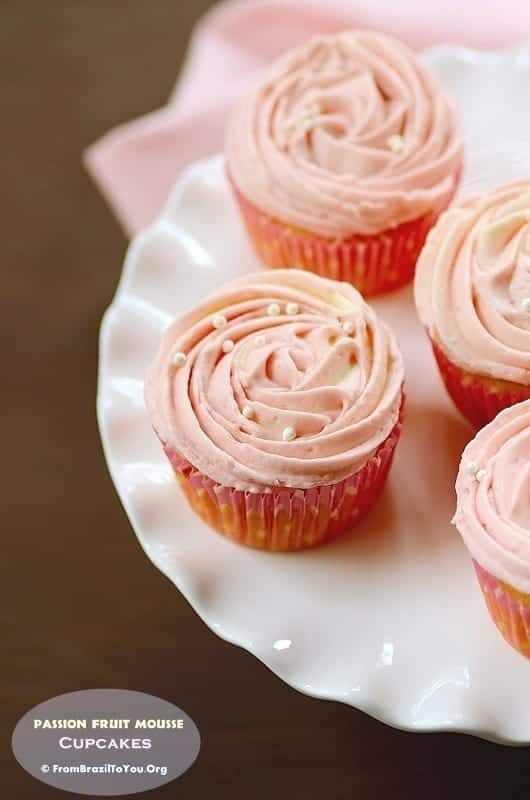 I hope you can make these cupcakes…You won’t regret it! You can also make more of the mousse, place in ramekins, and refrigerate. It is also a family favorite (although it is technically a cream, this is the way we make passion fruit mousse in Brazil. It’s super easy, creamy, and very addictive). 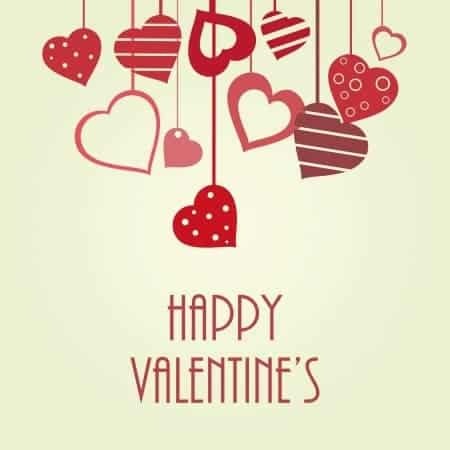 Happy Advanced Valentines to you too! Thanks, Raymund! For you as well.. Thank you! Those are super delish indeed. Could I substitute the passion fruit with another juice??? I’m thinking strawberry . . . would I need to change the recipe in anyway? Absolutely! 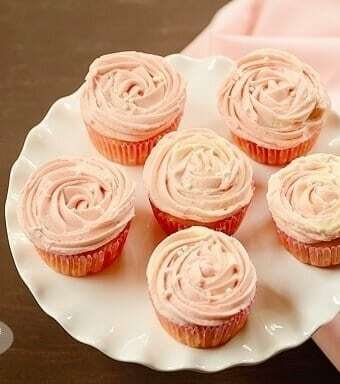 For the cupcake batter, you can certainly use concentrated strawberry juice instead of the passion fruit juice. But for the mousse filling, you better blend about 1/3 to 1/2 cup chopped fresh strawberries with sweetened condensed milk and heavy cream until obtaining a thick, creamy mixture. The reason why you should avoid to use strawberry juice for the mousse filling is because strawberry juice is not as acidic as passion fruit juice, resulting in a thin mixture. Have a great Sunday and thanks for stopping by. I am so sorry you did not have a good experience with this recipe. Mine turned out slightly fluffy (not puffy). In addition, I had no problem at all with the consistency of the passion fruit mousse. I don’t like to use creme de leche at all. It is not the same as Brazilian creme de leite. And even if I had to use Brazilian creme de leite, I would use the one that comes in a box rather than in a can (it contains whey). I used heavy whipping cream in mine, a good quality of sweetened condensed milk (some are thinner than others), and a good passion fruit concentrate. I blended them very, very well in the blender — until thick and creamy, and then refrigerated. When did you prepare the cupacake batter, did you use room temp eggs or cold ones? This can certainly make a difference. This is just me trying to figure what went wrong with your cupcakes. I hope this helps. Wishing you a delicious week! Take care. I’m also a very experienced baker & had the exact same problem with the batter. They all deflated & are undercooked & dense in the center. I’m just going to have to deliver them to the party & hope the coconut buttercream frosting I’m making distracts! Hi again, Madisen! In the post article I stated these cupcakes are dense so they’re not supposed to be light/too puffy like average cupcakes. Part of the center will need to be removed to be filled with the passion fruit mousse and then topped with buttercream.